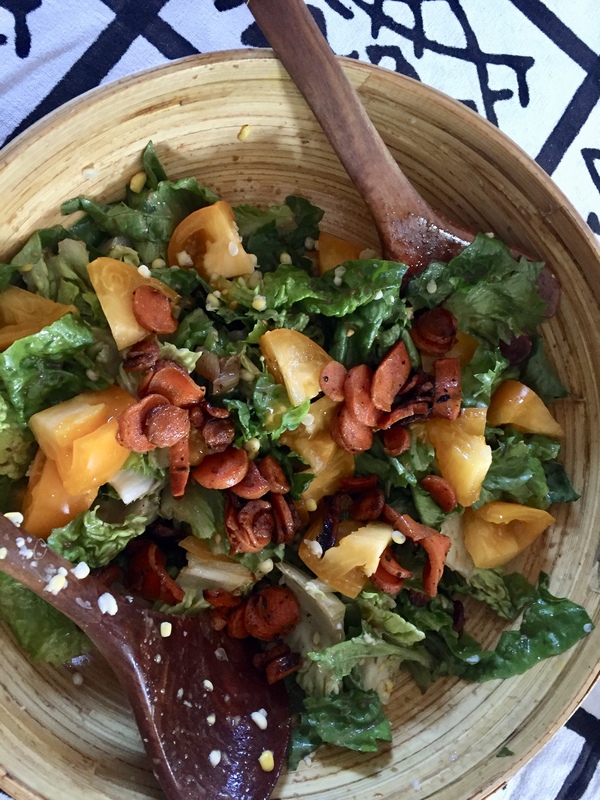 I’m reposting this as I think summer calls for cool, tangy salads, and this is one of my favorites. My German grandmother was a terrific cook. 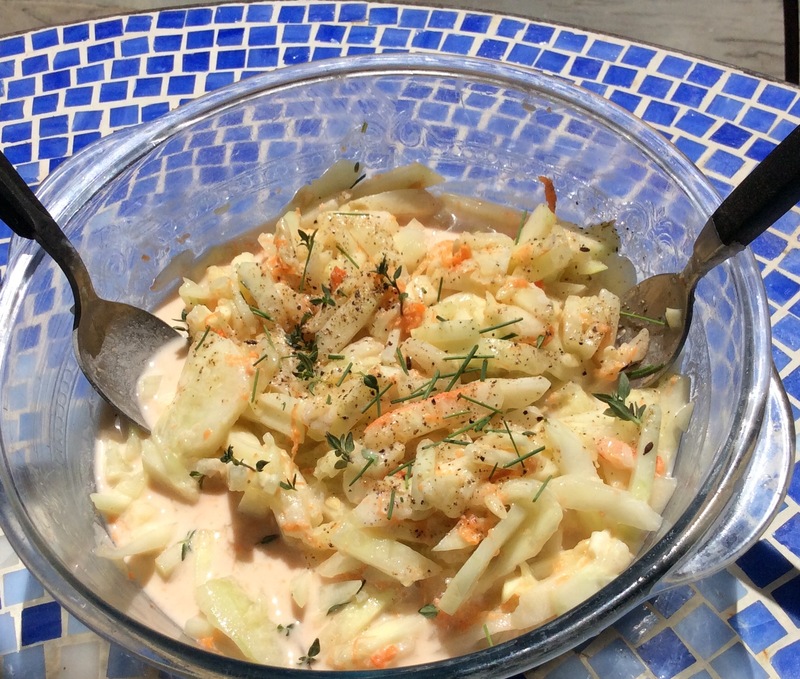 One of her specialties in summer was a refreshing cold salad made of sliced cucumbers in a creamy dressing of red wine vinegar and sour cream, topped with fresh dill or chives. My updated version juliennes the cucumbers, adds carrots and a yogurt-based dressing instead of sour cream. It’s easy to make, very tasty and refreshing as an accompaniment to a summer meal such as grilled chicken or burgers. I like it by itself for a light lunch as well. It also keeps in the refrigerator for at least a few days and gets even more flavor. It’s a funny thing- somehow marinating the cukes in this dressing makes them more digestible- as I find raw cucumbers sometimes upset my stomach. This salad never has. You can do the cucumber/salt drainage* technique in advance if you like but I confess I rarely have- as I am too impatient! Make the sauce first so the flavors can meld. Mix the yogurt (and sour cream if you’re using it), red wine vinegar, xylitol and seasonings (not the herbs)– I use a wisk. Taste to make sure it has enough vinegar- should be tangy. Peel and slice thinly or julienne the cukes- I use a Mandolin with the julienne blade. Let sit in refrigerator for at least 1/2 hour before serving. * To drain and remove excess moisture from peeled, sliced cucumbers in advance of making the salad; put them in a colander with a larger bowl underneath. Sprinkle 1 tsp. salt or more depending on amount of cukes, (sprinkle lightly) and let sit for approximately an hour. You can then blot with paper towels. It does help to keep them crisper and less watery in the salad. Make the sauce first so the flavors can meld. Mix the yogurt, red wine vinegar, xylitol and seasonings (not the herbs)– I use a wisk. Taste to make sure it has enough vinegar- should be tangy.